608 pages | 38 B/W Illus. The remains that archaeologists uncover reveal ancient minds at work as much as ancient hands, and for decades many have sought a better way of understanding those minds. This understanding is at the forefront of cognitive archaeology, a discipline which believes that a greater application of psychological theory to archaeology will further our understanding of the evolution of the human mind. 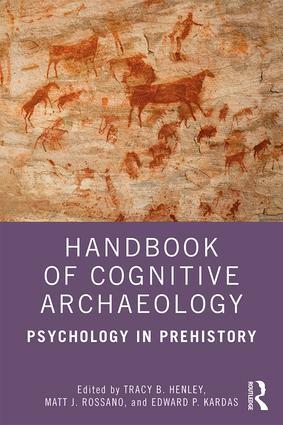 Bringing together a diverse range of experts including archaeologists, psychologists, anthropologists, biologists, psychiatrists, neuro-scientists, historians, and philosophers, in one comprehensive volume, this accessible and illuminating book is an important resource for students and researchers exploring how the application of cognitive archaeology can significantly and meaningfully deepen their knowledge of early and ancient humans. This seminal volume opens the field of cognitive archaeology to scholars across the behavioral sciences. Tracy Henley is Professor and Head of Psychology at Texas A &M University, US – Commerce. He works primarily on historical matters, social cognition, and psycholinguistics. He has several previous books related to the history of psychology. Matt Rossano is Professor of Psychology at Southeastern Louisiana University, US, where he studies the evolution of ritual, religion, and cooperation. His books include: Supernatural selection: How religion evolved and Mortal rituals.